T he news these days is often depressing at worst and frustrating at best. It’s easy to get caught up in the spin cycle and let it get us down. Never fear… The News Blender has you covered. 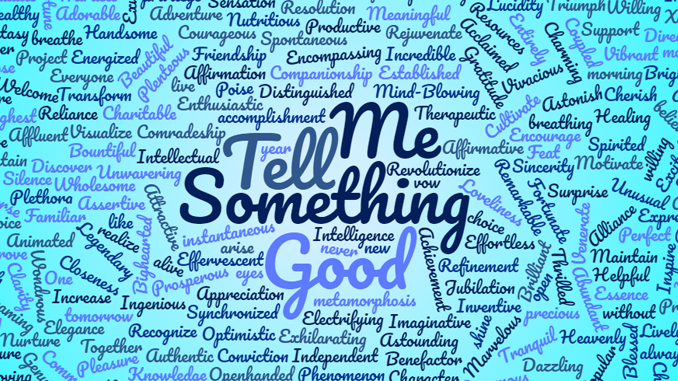 Once a week, we feature Something Good and, in return, all you have to do is tell us something good that has happened to you this week, something you are thankful for, a joke, a cute animal story, an inspiring tale of heroics, a Random Act of Kindness… SOMETHING good. This week’s Something Good is about friendship and being human. On February 1, Carter Jean Armentrout made a friend while waiting for her flight. Her dad, Kevin, memorialized the event with a picture which he shared the next day on Facebook. Carter, an inquisitive and friendly 16-month old, was making the rounds saying hi to everyone waiting to board their plane, Kevin says, but when she got to Joseph Wright, he didn’t just say hello back, he extended a hand of friendship. She sat with him for 45 minutes. Joseph let her draw and watch cartoons on his tablet. Carter shared her snacks with him. The next day, Kevin wrote, “Watching them in that moment, I couldn’t help but think, different genders, different races, different generations, and the best of friends. This is the world I want for her. We so often focus on the differences between us and forget that we are all, regardless of age, race, gender, nationality, religion, and political party, humans. Joseph and little Carter exemplify this. Friendship is Something Good and so are snacks and drawing pictures on a fellow traveler’s tablet.